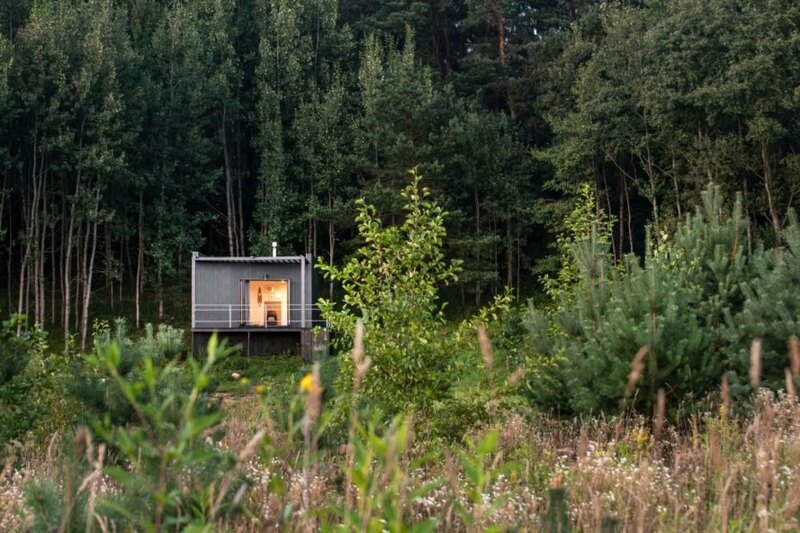 Designed by Ema Butrimaviciute of Lithuanian studio Utopium, the Etno Hut is a 150-square-foot, off-grid retreat tucked into a remote forest in Lithuania. 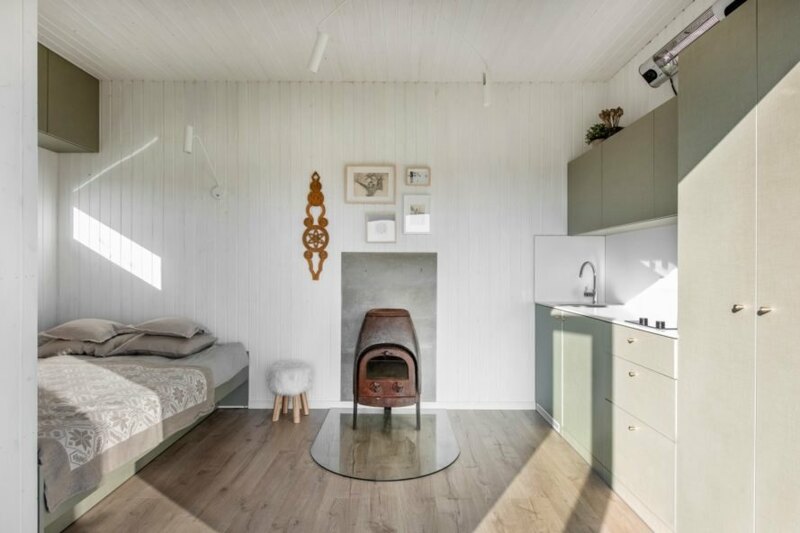 Surrounded by breathtaking vistas, the tiny cabin, which was built with minimal impact to the landscape, is designed to provide a serene retreat for those looking to reconnect with nature. The cabin’s location, set in an expansive forest that sits between two Lithuanian cities, was strategic to its use. Wanting to provide city-goers with a serene weekend escape, the architect imagined a quiet retreat where anyone can escape from the hustle and bustle of city life without the inconvenience of driving for hours to get there. 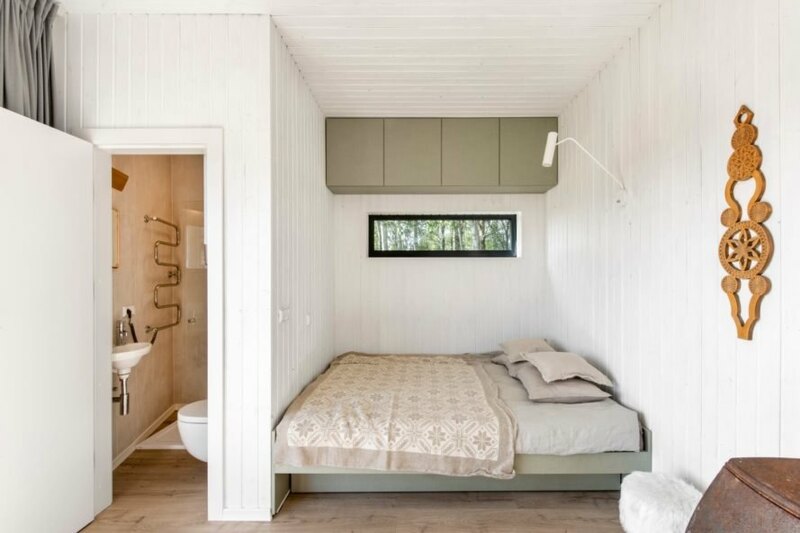 Tucked into the edge of an expansive, lush forest, the tiny cabin was built on a slope facing south. Its orientation was strategic to take advantage of the sunshine and stunning views. The structure was built on a steel foundation screwed into the ground by hand as to minimize impact on the landscape. The entire hut, which was constructed out of Structural Insulated Panels (SIPs), was assembled in just three days. From a distance, the 150-square-foot cabin is virtually camouflaged into the forest backdrop thanks to its dark black facade. A large open-air deck leads to sliding glass doors that open wide to create a seamless connection with the landscape. On the interior, white walls and wood flooring brighten the modern living space. The cabin has a king-sized bed and a pull-out bed, a bathroom with a shower and a fully-equipped kitchenette. The space is meant to provide a relaxing atmosphere, with no transformable furniture or ladders — just everything needed for simple, uncomplicated living. The Etno Hut is a 150-square-foot cabin in a remote forest. 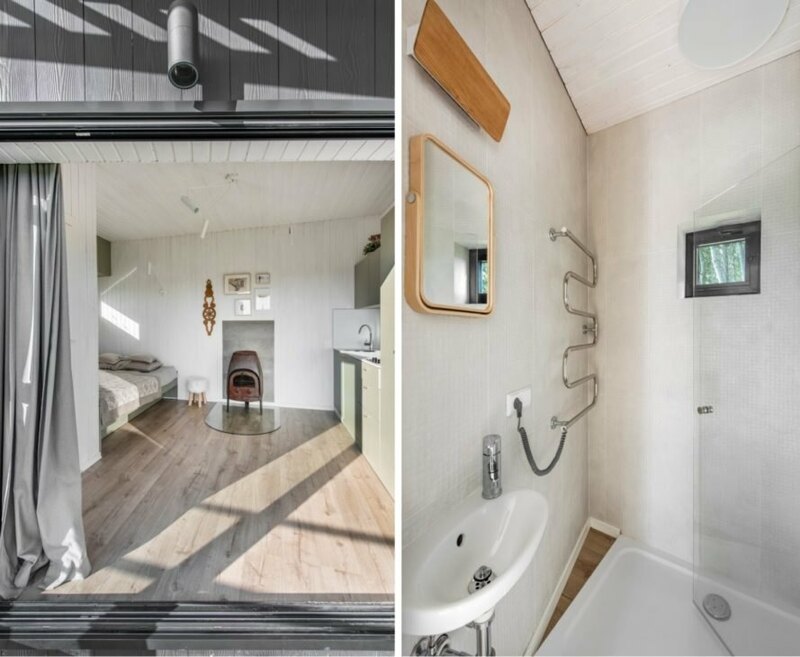 The tiny hut is perfect for a romantic, off-grid retreat. The interior design is contemporary and minimal. The inside has all of the basic amenities with no complications. The white interior is further brightened by an abundance of natural light. 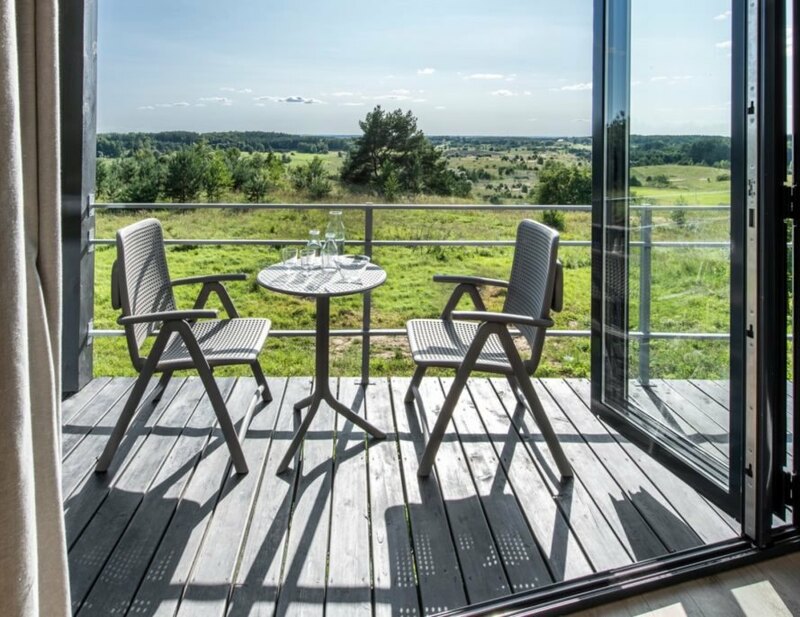 An open-air deck is perfect for enjoying the views. The space has a strong connection to the surrounding nature. 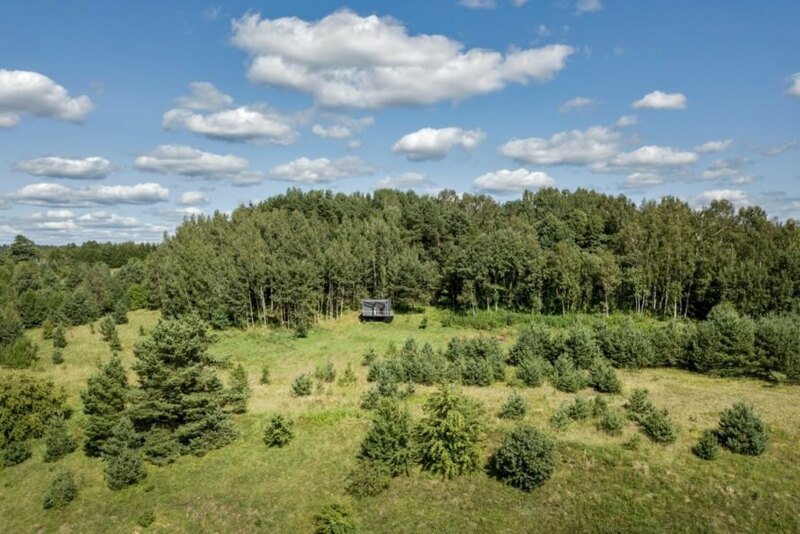 The black hut is tucked away into a lush forest between two cities in Lithuania.